There are six Asian bush honeysuckles that have been introduced into North America and are now naturalized here. Three of these, Bell’s, Morrow’s, and Tartarian honeysuckle, are found in Minnesota. 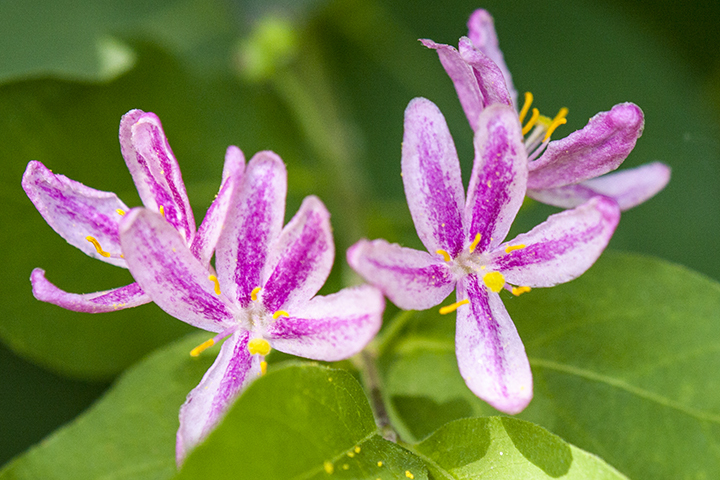 A fourth, Amur honeysuckle, has spread to Wisconsin and Iowa and will probably reach Minnesota soon. In the past, Bell’s honeysuckle (Lonicera x bella) was widely planted in eastern and mid-western North America, including Minnesota, to control erosion and as an ornamental. It has since spread aggressively to a broad range of natural and semi-natural habitats. It leafs out early in the spring, grows vigorously and large, crowds other plants, shades the ground, and uses available soil moisture and nutrients. It may also release a chemical into the soil that further inhibits the growth of other species. Bell’s honeysuckle is a horticultural cultivated fertile hybrid of Morrow’s honeysuckle and Tartarian honeysuckle. As a hybrid, it shares characteristics of both of its parents, and is difficult to distinguish from them. Bell’s honeysuckle is identified by its leaves, which are sparsely to moderately hairy on the underside, at least along the main veins; and by the minute bractlets at the base of each flower, which are at least half as long as the ovary which they subtend. This entry was posted in Plants and tagged Bell's honeysucklem Lonicera x bella on February 1, 2017 by John Valo.